It is often an Animal Print request is received accompanied by only one photo. One shot Gadora has at getting their color and expression right. One photo clandestinely lifted, e-swiped or borrowed for a secret project. Such was the case with the photo from Indianapolis of Alli and Scout, a pet portrait request for a friend. 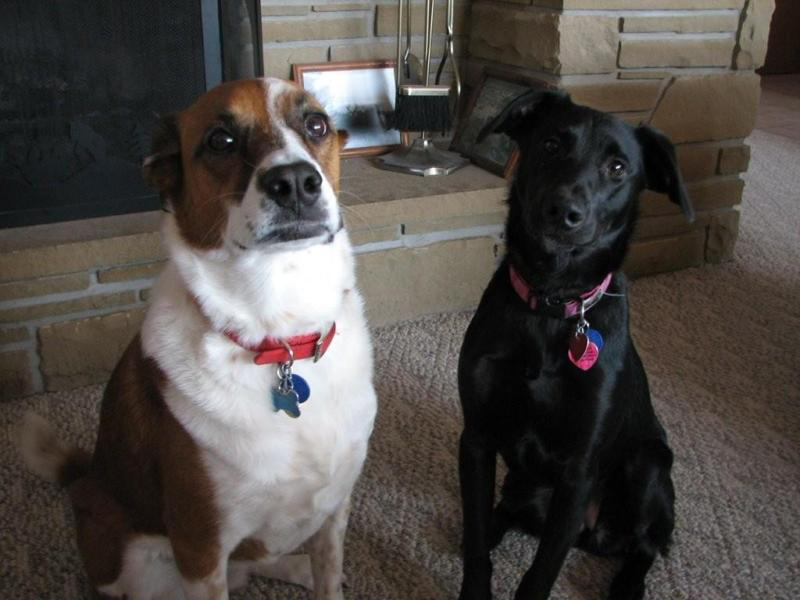 Meet Alli and Scout. Both are mixed-breeds and sound quite the hand-full. “Alli is a boxer shepherd mix, I think. Scout is lab and not sure what else. The two don’t play nice together so my friend spends a lot of energy keeping them apart. This is one of the only pics of them together.” It was a little smaller that Gadora preferred, but would do just fine. Adding some heat in the background via the fire place, and removing the tools, I gave them a suitable backdrop. Posted on October 2, 2009 October 11, 2009 by gadorawilderPosted in ANIMAL PRINTSTagged animal print, water color. 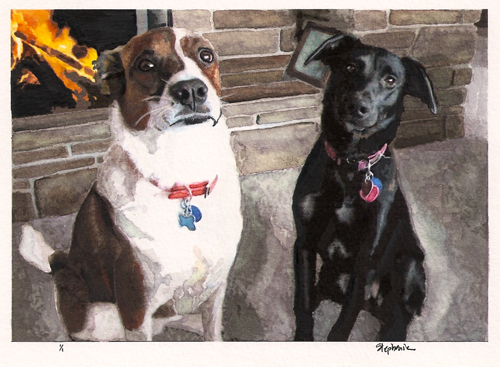 Just got my water color of Alli and Scout BEFORE they started giving each other the “stink-eye” and not getting along! I love it, love it, love it, and Lori framed it beautifully for me!! I’m taking it to work to show everyone, but bringing it back home so I can see it all the time! Thanks for such good work and the added warmth of the fire! !